Shortly after the break, Justin Bonomo and Daniel Negreanu stuffed their chips in. It started with Bonomo peeling on the button. He made it 200,000 and Negreanu called with . The dealer rolled out a flop and it became apparent that both players would be in for a big betting round. Negreanu checked to Bonomo who continued for 160,000. Negreanu reached to his piles and countered with a 500,000-raise. Bonomo fired back, announcing 1.25 million and Negreanu processed his options. He burned an extension card and after a minute, he shoved all in for 4.4 million total. Bonomo immediately called. "I got the other stuff," Negreanu said after seeing Bonomo turn up the top set. "Good flop!" "We need a five or a ten" Negreanu announced to his fans in the rail. "Five on the turn for fun!" But it was the instead. "Five or ten or Justin Bonomo will be our Super High Roller Bowl champion!" Negreanu did some commentary while waiting for the final card. Then he shouted the familiar phrase: "One time!" making the whole crowd laugh. The river came the , missing Negreanu's straight draw and giving Bonomo a full house to close things out. Both players shook hands and exchanged compliments. 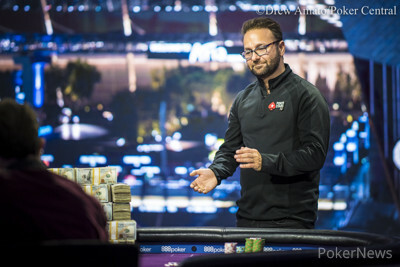 Negreanu pocketed $3 million for his efforts while Justin Bonomo took down the title along with a $5 million top-prize. What's All This Talk About the All Time Money List? Where Do All the Players Come From?